Hambright stands with LAUSD Teacher Quality Specialist Robin Share and Daniel Pearl Magnet High School Principal Deb Smith. He was honored at Dodger Stadium on Aug. 13. Photo provided by Wes Hambright. 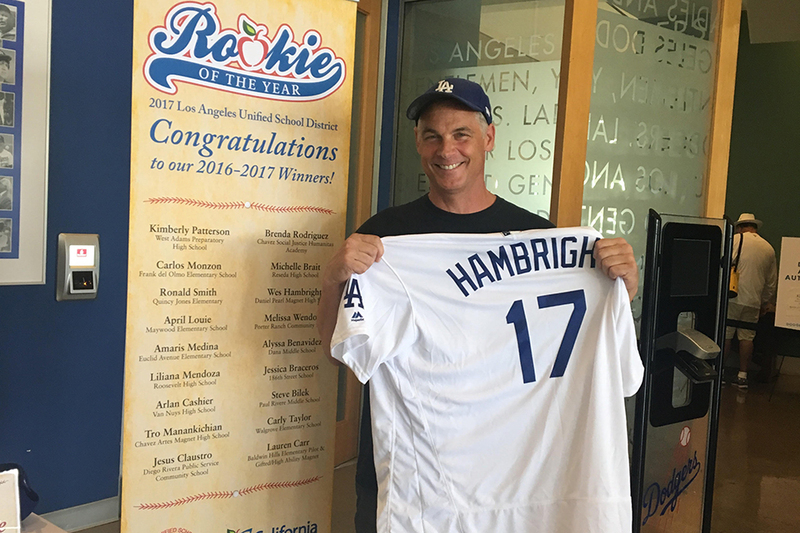 Decked out in Dodgers gear, Hambright poses next to a LAUSD Rookie Teachers of the Year poster. Photo provided by Wes Hambright. With the help from CSUN, music veteran Wes Hambright is a 2017 LAUSD “Rookie Teacher of the Year.” Photo by David Hawkins. Since childhood, Wes Hambright had planned to play music professionally. Teaching music, on the other hand, wasn’t something that immediately came to mind for the talented composer, whose music has been featured on The Ellen DeGeneres Show, American Idol, The Tyra Banks Show and programs on the Discovery Channel. Hambright never looked back. 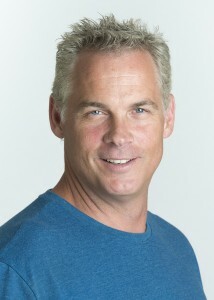 After speaking with a neighbor in 2015 who mentioned that Daniel Pearl Magnet High School — in Lake Balboa, next to Birmingham High School — had lost its music teacher weeks before school was about to start, Hambright applied for an emergency substitute teaching credential and began to teach music classes a few days a week. The school hired him as a full-time teacher in August 2016. Now, with the help of California State University Northridge, he’s been named an LAUSD Rookie Teacher of the Year. 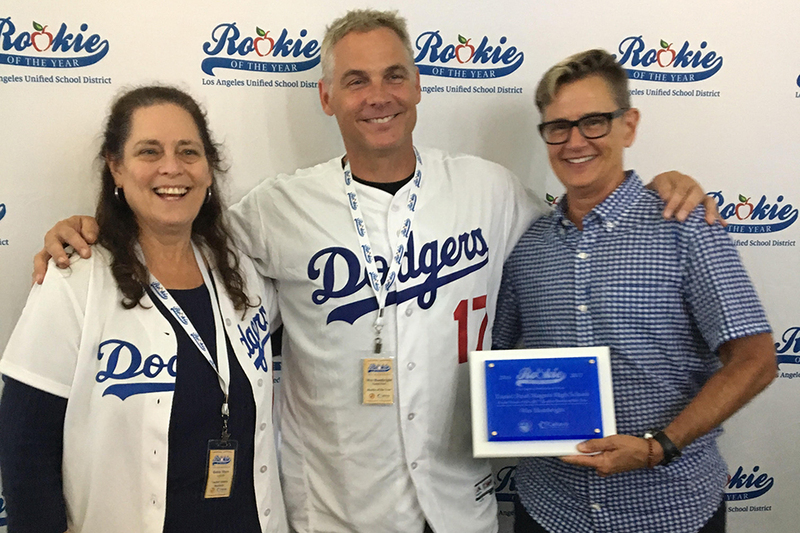 On Aug. 13, Hambright was honored at Dodger Stadium before the Los Angeles Dodgers took the field against the San Diego Padres. What makes Hambright’s journey even more unique was that during his 2016-17 “rookie” year, he was taking night classes at CSUN toward his teaching credential, which he is on track to complete in 2018. In the meantime, Hambright has an “intern credential” from CSUN, which means that he is employed as a teacher while enrolled in the university’s teaching credential program. The musician has flourished in CSUN’s credential program and as a high school music teacher, but it’s been far from easy. Although challenging, teaching has been an extremely rewarding experience, he said. Hambright, who also composes contemporary ballet music in Los Angeles when he’s not teaching, noted that his favorite part of teaching at the high school level is preparing his students for bi-monthly concerts in front of family and friends. In the classroom, Hambright stresses listening above all. He makes it a point to listen to the same music his students enjoy and asks his students to reciprocate. Hambright credited a large part of his early success to CSUN and his mentor, CSUN Coordinator of Music Education Mary Schliff, who came to his class a handful of times over the past year to observe and give pointers. If the first year of his teaching career was any indication, Hambright has a bright future.